Multifocal lenses offer excellent potential for reducing your dependence on glasses and contact lenses after cataract surgery or Refractive Lens Exchange. These lenses work by providing simultaneous near and distance vision in each eye, thus allowing both eyes to work together to provide a wide range of vision near and far. In 2005 the FDA approved two new multifocal lens designs which enjoy advanced optics and deliver on the goal of good uncorrected vision distance, near, and in between. Dr. Martinez has extensive experience with these lenses and has been actively involved in the use of multifocal and accommodating lenses since 2003 when they made their first FDA approved appearance. The breadth of his experience with this type of vision correction translates directly into a visual benefit for you. Success with these lenses is highly dependent on advanced diagnostic technology, impeccable surgical skill and reproducibility. All of these ingredients are present in his practice and have kept him at the forefront of vision correction surgery in the Treasure Valley since 1993. 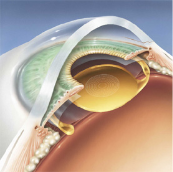 The ReStor Lens: manufactured by Alcon. The ReStor lens provides excellent distance intermediate and reading vision aimed at reducing your dependence on spectacles. Dr. Martinez and his staff will spend quite a bit of time exploring your vision needs with you to suggest the best possible fit for your lifestyle needs. 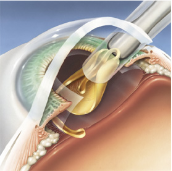 This is a very important part of our commitment to excellent individualized eye care and is a cornerstone in successful surgical vision correction. All multifocal lenses have the potential to create glare and halos especially at night and especially soon after the surgery. These halos tend to diminish and/or disappear over time, however, about 1 in 20 patients describe the halos as “severe”. Multifocal lenses work best with binocular vision (both eyes working together), therefore you will achieve the best effect in vision when you have had surgery on both of your eyes.